So that is it 21 in two months taking the total for the year to 85 books which is exactly same as August last year .I ve read lot english books but going be posting them in between translations reviews for a while .Off the books read the Phantoms of Breslau and down the rabbit hole were my huge favourites .I read three longlisted booker of them the stranger’s child was just my favourite .What you’ve read recently ? plans for next month well I m reading very short novellas next couple of weeks to give me things to review whilst I make my way through the 1100 plus pages of Parallel stories from the end of the month and I think it will take a month to read with some other books thrown in .What are your plans for September ? Andrey Kurkov the ukrainian writer is probably best know for the first of his Penguin books death and the penguin which I reviewed a while ago here ,he has written 13 novels and a number of children’s books in his time .He is well known for his dark humour and satire . 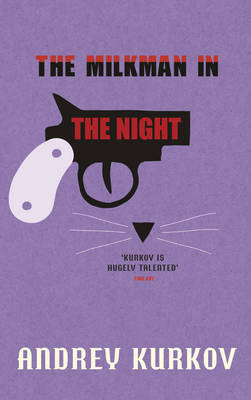 This his latest book in translation ,is yet again set in and around the capital of Ukraine Kiev .Yet again like in death and the penguin the main character is a middle-aged man .Semyon a body-guard by day , he is married but has starterd to sleep walk every night ,and appear with his clothes in a mess every morning ,his wife doesn’t believe he is sleep walking so he asks his friend to prove this is the case and he find as out he visits a women every night .Elsewhere Irina a single mother sells her breast milk to a strange variety of characters .We also have a politician Gennady a man who is on the rise with influence post orange revolution ,his is a double edge character thou good and generous but also easily cuts people off .Elsewhere the is Dima an airport security guard at Borysil airport with his sniffer dog , who finds and then steals a case contain a mysterious drug ,the maker of the drugs we also meet at the start as he is murdered ,oh and then there is fluffy the cat as well . Just the he heard from outside the familiar unpleasant snarling of the neighbour’s bull terrier ,which went by the name of king .Dog and owner were equally objectionable .Instead of taking the dog for a walk its owner would sometimes just let it out in his front yard ,whereupon it would make a beeline for Dima and Valay’s front yard and do its business and chase their cat Fluffy if he should happen to be nearby -before retreating to its own territory . Dima’s home life early on in the book . Now as you see this book has a number of smaller stories making it up into a whole the stories do cross at points during the book ,its like the film short cuts or Magnolia where we dash in and out of the lives of people as we view a cross-section of Kiev from the rich to the poor single parent ,families and even the pets make appearances here .Kurkov,s talent is keeping you interested in the vastness of the work with out making you feel you have to take notes to keep up , every twist and turn the stories of their lives gets more comic ,in some ways this could be fraiser (us tv show) as scripted by Anton Chekov it has the feel sometime like Frasier the characters get caught up in a comic moment from one action .This will appeal if you liked death and the penguin, but the again if you though death and the penguin a little to surreal to read maybe this one will appeal more, it is tinged with surrealism but not as much .This book made me laugh and made me cringe at times .The translator is different from his earlier books I prefer This translator to the earlier one for some reason can’t put my finger on it just seemed more straight forward . 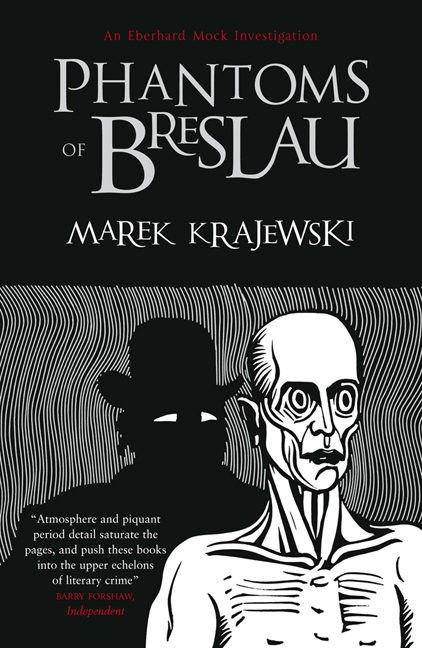 Well its sunday I ve just done my BBAW links for my nomination .I ve had a busy week at work ,but that said I managed to get a bit of reading done all said ,I found a new crime writer I love the Polish writer Marek Krajewski his Eberhard Mock has been a revelation to me ,Krajewski is a master of description so I feel I ve spent a couple of days in 1919 Breslau not 2011 Derbyshire which is good the weather has been terrible here this week.I went to town yesterday with Amanda and pick some books up from Oxfam and a half price copy of the new Julian Barnes which is longlisted for the Booker prize .Amanda went to Bakewell yesterday so we had some Bakewell tart for our supper last night ,the original tart is so much tastier than the other ones you can buy from elsewhere in the country .so that’s been part of my week ,I m keeping an eye on the hurricane and hoping people are safe. 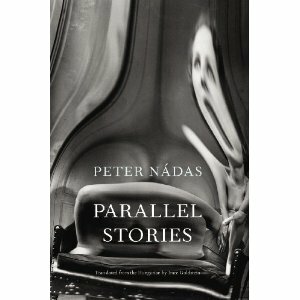 Rarely do I get really excited about a book and a writer but this book and its writer deserve to be shouted about ,this is the latest book from the hungarian writer Peter Nadas ,it took him 18 years to write the three volumes that make up parallel stories and it has taken the translator Imre Goldstein 5 years to bring the book to english .It is 1152 pages long so is one of the longest books in translation .The book covers post war eastern europe from end of war the Budapest uprising in 1956 to the fall of the berlin war .I think this book is probably going be the best insight into living behind the iron curtain in fiction .Its told through a number of characters from Germany , Hungary,with its main focus on two families one German ,one Hungarian there is a in-depth interview with him about the book here .The book is due out in November I will be reviewing it then over three days as three books that make the complete book .I feel this is a strong contender for the 2012 Independent foreign fiction prize as a book of this scale rarely comes round . I think it’ll take a month for me to get through the book . 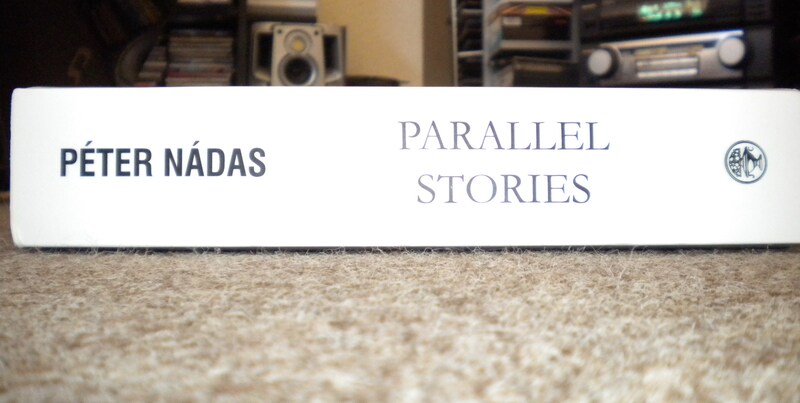 Enrique De Heriz is from Barcelona ,this is second novel in TO be translated to English ,a best seller in his native spain when it came out .He is also well-known as a Translator of books from english into spanish . The manual of darkness at it heart is the story of Victor Losa we follow him over the period of a year at the start of the book he is a well-known Magician who has just been named the worlds best magician ,just as this happens he is struck down with blindness a huge moon like white spot in his vision ,the early part of the book deals with his initial reaction to this and also we have two other narratives one about his father who was a bit odd a scientist that loved keeping ants nd seeing how they live .The other narrative is Victor tracking the history of a Victorian pickpocket called Peter grouse he finds this out via his mentor Mario Galvan they also discuss a myriad of other subjects .As the book unfolds , we see that the chance tha Victors sight is going to return is very slight ,so he seeks to help via a helper from ONCE ( the spanish equivalent of the RNIB in the uk ) Alicia helps Victor learns about how to cope in a unsighted world ,in the latter parts they are vignettes of famous blind people as we see how they coped with there sight loss .In the end victor starts to come to terms with his new life . such a small degree of hope is like a minuscule balcony in a poor man’s home .Perhaps it looks out towards the bleak north ,perhaps it is not large enough even for one miserable chair and perhaps ,over time serves only to house three empty flowerpots that upon a time contained something living .It extends the space of the apartment only in the mind of those who live there .This is its meagre function ,and even if it succeeds in this it is a miracle ,Victor spends little time nurturing this vain 0.2 per cent of hope ,and whole days mony of them ,regretting that it will not come to pass . Where do I start with this book ,well at his heart is Victor he is a man who has gone from the top to the bottom of the world in a second as he lost his sight ,but he copes in a way as he learns new things as he once spent a lot of time learning new tricks ,also a link back to when his father told him ants are deaf he links this own blindness also an either or situation of which is worse condition .The book does what a lot of modern Spanish fiction does and that is make you think beyond the story into your own life and those around you .I suppose the nearest comparison would be the works of Carlos Ruiz Zafon like his books this is a book that has many different levels to it .As ever Franks translation is well executed . The german longlist for the Deutscher buchpreis has been announced ,the german version of the books of the longlist see it here in full only few on names are familar to me ,but my german friend on twitter recomends this one by Klaus Modick -sunshine ,a man in california learns of Brechts death a man he knew in a love hate relationship . 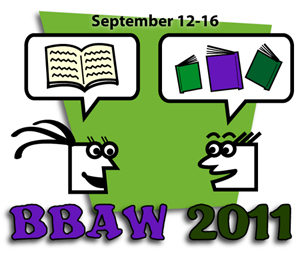 I m so happy my blog has been longlisted in the best author interview category .I feel this year I ve had some really strong interviews with some great writers and translators from all round the world .I ve also been ask to judge ,which I m happy about as I want to give something back to the blogging community as I do sometimes moan .Thanks to all that nominated winstonsdad . As I went out this morning to take Winston for his morning walk I put my I-pod nano on as I do every day as I went round the tracks shuffled through ,as we walked round .Then mid way it clicked on Titus Andronicus clicked on with a track from there debut album the airing of grievances as you imagine with a band named after a Shakespeare play there are some literary titles on the album and it was one of these it clicked on” Albert Camus ” the french Algerian writer has inspired many bands over the years to name a few The Cure use one of his books for a song and the band The Fall . then after a track by the Manchester band inspiral carpets ,came up Ryan Adams song Sylvia Plath his ode to the late poet and former with of Ted Hughes ,like Ryan I wish I was in Spain or France today not with Sylvia thou ,with my darling Amanda .I ;love Adams and the album this is from touches me every time I hear it . Has anything like this happened to you ? what is your favourite bookish music ? Nicholson Baker is an american writer ,I reviewed Vox a few weeks ago as part of the new Granta reissue series and now bring another from the four reissued books with their lovely Village green designed covers . 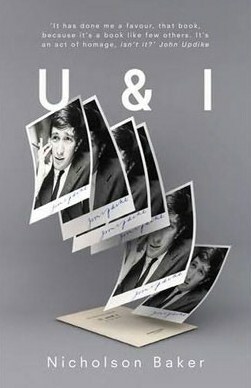 So U&I what is it about ,well it is about John Updike (a point to note here for the readers is I share a birthday with mr Updike so have a huge soft spot for him ) it is about John Updike books yes and no ,is it about John Updike the man well yes and no ,this book is hard to pin down to a non fiction category ,the book starts with Baker deciding to write a piece for the Atlantic magazine about Updike but as he starts on this it obviously grows into this book .Baker takes us on a journey through his mind and how his mind has absorbed John Updike’s works and his numerous interviews he has read over the years .As we go along this path we dart here and there into Bakers wider reading habits and how he interacts with books and how he has viewed Updike’s criticism in the past ,Updike was a great critic in his day and some one who you feel Baker admired .Now your asking did they know each other well they meet once at a Harvard lampoon party where he got Updike to sign a copy of rabbit is rich ,he was amazed to find out that Updike had read one of his short stories . AT the offices of the Harvard lampoon ,in november 1984 ,I sprang out in front of him near a plate of ham cutting as he was hurrying leave the post Harvard-Yale game party . SO what did I make of this book ,I loved it ,I like Bakers loose stream of consciousness style in the book ,it feels like you’re in his head holding a conversation with him ,this is definitely a bibliophile’s book as it is so full of book love ,he mentions so many books and why he likes them I feel I got a hold new insight into some books I ve missed by his slight mentions of them ,as for Updike and I ,the I in this case being me Stu the writer of the blog ,well I ve read four of his book like most people three of them are the rabbit books ,which I feel are the best insight into the post war american experience the other is the eastwick book .I ve a few of his other books on my shelves am I in a rush to read not really I have a soft spot as mention but I also have another 40 plus years hopefully in front of me to get to them so like Baker who has also not read Updike’s Cannon ,I m in no rush to tick him off my read list as I want to experience Updike for years to come and also I feel the same about Baker so the review of the other two reissues will be a some point in the future . Have you read Updike ? Sergios Gakas studied in france in paris ,he studied theatre ,after that he took up writing first with plays for children finally turning to fiction in 2001 ,this book was published 2007 .his books have also been translated into french and Italian . 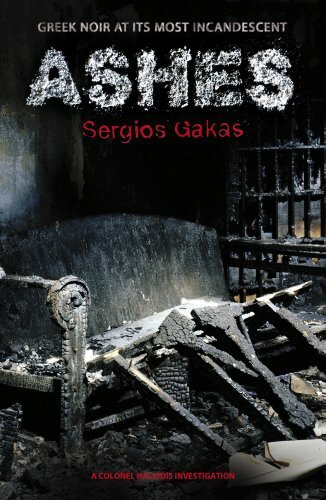 Ashes is set in Athens in 2004 just before the Olympics and there is a huge fire in a house ,a former actress Sonia Varika is in the house she shares with a African family of refugees ,but she is the only member of the household to survive the fire ,it so happens that the next two nearest people to house ,fire and case happen to be here Ex’ lovers .one is the landlord of the house Simeon Piertzovanis he is a man who has drifted, he was a lawyer and now a slum landlord and a man looking for solace in the bottle ,the other is Colonel Chornis Halkis ,he is the police man assigned to solve how the fire started and who had started it , he works for internal affairs in the Hellenic police force .So as you see this is in the classic noir formula if you weren’t told it was Greece by the names and places it could be any where ,ex lovers ,secrets and lies ,love rivals all play a part as the book unfolds ,given the fact that Gakas has mainly work in the theatre before writing fiction this book is driven forward by the dialogue between the characters partly the two male leads which have some great inter actions during the course of the book .also the fact space is need for the olympics that is just round the corner and Athens is all of a flutter with that as well . Simeon and Vhronis meet early on in the book . I like this book as soon as it hit the door step ,I love old noir films the tense and darker side of the world where no one is black or white just lighter and darker shades of grey ,so it is here the two men both have the failing but in varying degrees ,Sonia is a classic femme fatale but one who’s beauty is past and is in decline but she has at times touched these mens lives and that plays its small part in the case ,there is also pressure on Chronis from outside and inside the police and also this leads Chronis into drugs himself much as Simeon is heading deeper into the bottle .also racism raises its head as there is a lot of tension between the refugee /native greek communities .so all in all a classic noir reset in modern Greece .the translation works well the dialogue in particular has a good flow to it . 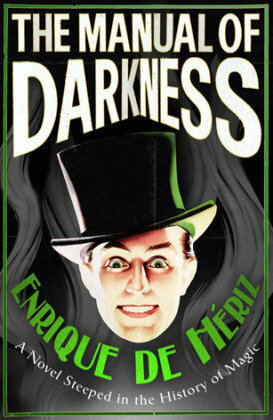 Do you like Noir ? Have you a favourite greek book ?